This entry was posted in Safety at home on 2018/10/10 by Susan. Halloween is a time for fun and treats, but let’s not forget about staying safe. I write about this every year because it’s important to remember. Halloween is nearly here – so please check out these important safety reminders. Choose Halloween costumes with health and safety in mind. The Alberta College and Association of Opticians makes a good point about not re-using costume contact lenses from last year. Microorganisms could have contaminated your contact lens case since you last used the lenses, posing a risk to your eye health. Never use contacts past the expiration date, they advise. When the package says three months before the contacts expire, it doesn’t mean three months of wear, it means three months from the time you open the package. This story from Global News describes what can go wrong if costume contact lenses are not used properly. 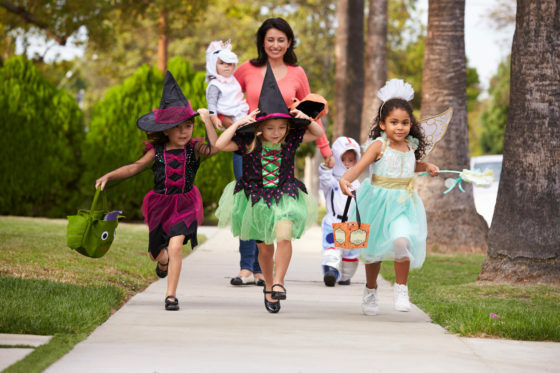 Think twice before you or your kids try on costumes in a store – they might be infested with lice. See this Huffington Post story about the topic, which is making my head itch just thinking about it! Blech! If you’re planning to give out treats on the big night, remember the kids with allergies to peanuts and other foods. The Teal Pumpkin Project is raising awareness about food allergies and asking people to put a teal pumpkin on the doorstep to indicate they have non-food treats available, such as glow sticks or small toys. These are just a few of many things to keep in mind for a safe and healthy Halloween. Do you have any tips to share? Please let me know, in the comments below.